Nice day out in B'ham, which is always good, though expensive (Cross Country trains are plain thieves! ), as a means to escape dreadful Burton. Lovely, aren't they? And the store's interior design was superb too. Well, at least to my liking. Everytime I see an old sewing machine, I get the chills. Then, we took the opportunity at hand to visit Tom Murray's photographic exhibition with inedit Beatles photos from the summer of 68. We particularly enjoyed to see the goofy side of Paul, the pensive look of George and the unique style of John. Yeah, Ringo is always there too but he's not that expressive, so he looks about the same in all pictures. Here's one from the exhibition where, according to the photographer, Paul was really on the verge of falling down. After this cultural bit, we went to fill up our tummies. We decided to try out the South-American restaurant Las Iguanas. We had checked up the menu beforehand and therefore we already had in mind what we wanted to eat. We still couldn't resist to try the Bolinhos S. Paulo, saltcod & potato fritters with chunky tomato salsa & sticky balsamic who are basically a version of the original Portuguese codfish cakes (pastéis de bacalhau). My mind was already set on the Moqueca which I did choose. For those of you who don't know this dish, it basically consists of a creamy coconut curry with peppers, garlic & sweetened with tomatoes. It is served with rice, sweet chunks of plantain, spicy salsa & crunchy coconut farofa (toasted manioc flour) to sprinkle over. Although this dish is more traditional with fish, I opted for the veggie version of it. It was quite spicy but very bearable and to my liking. I decided to accompany it with the Mexican beer Negra Modelo (5.3% ABV) which had a lovely scent, a mild and quite fruity taste, blending really well with my dish. Hubbie opted for the Xinxim dish, a Brazilian lime chicken in a creamy crayfish & peanut sauce with rice, fine green beans, coconut farofa (toasted manioc flour) to sprinkle & sweet plantain. It is said to be Pelé’s favourite dish. In fact, it was quite mild, therefore a good choice for him. 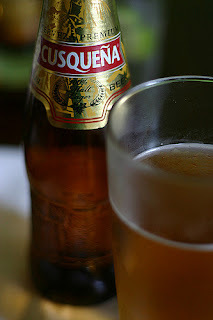 He enjoyed my other beer pick, this time the blond Peruvian lager Cusqueña (5% ABV). Also a bit fruity but very fresh and mild, yet strong enough. After lunch, we had a long walk towards the Jewellery Quarter, always in a upward direction (quite tiring when your tummy is full and you are just longing for a siesta).We went to a nice unissex hairdresser we found out last year and that my husband eventually tried before Christmas. This time, we both needed a serious haircut. We just don't get what's with this country that makes our hair grow so fast in so little time. On top of that, hairdressers prices are extremely high, especially in Burton (where bizarrely enough there must be over 50 hairdressers), so we opted for a cheaper and more adequate option. With the hair sorted, we came back home. I prepared a nice tenderloin pork in the oven, with roasted parsnips & carrots, and steamed brocolli. Some Portuguese Rosé and Cider to complement, and that's it for today. We are off to bed to enjoy a good night's sleep.